San Diego Comic-con is in full swing right now. But if you are reading this, you're probably not there. You're probably still stuck in the Cleveland area, with your own lonely action-figure collection and Hollywood fantasy/sci-fi/horror discs, and VHS tapes. Airfare to San Diego Comic-Con is quite outside your budget - not to mention admission at the door. You probably can barely afford to leave your parents' basement where you've been living for the last 30 years, like a forgotten Ariel Castro hostage in a state of Rust Belt permanent-recession squalor and minimum-wage poverty. A life in which the louche thrills of scary movies and canonical Bela Lugosi/Boris Karloff B-programmers emceed by Big Chuck were the only reliable escape. No, even if you did sell a kidney or something to get money, San Diego Comic-Con would probably turn you away at the door anyway, just for being a homely Ohioan, not worthy of entry in a southern California public event. That Wonder Woman cosplay outfit is not fooling anybody. But wait! There is a ray of hope for lonely genre fans here in flyover-land, and it resides in Akron. Its a spinoff of the Akron Comic-Con. MonsterFestMania is a nostalgic fan convention and appreciation of vintage late-nite creature-feature culture, exemplified by Ghoulardi and his durable heir apparent in the Akron-Canton marketplace, Son of Ghoul. The Son of Ghoul marking an incredible four decades on continuous duty in the horror-host biz - will be just one of the VIPs visiting for the weekend (and none of those annoying communist protesters that made the RNC in Cleveland a bloodbath). Other visitors include original TV Addams Family cast members Lisa Loring (Wednesday Addams) and Felix Silla (Cousin Itt). 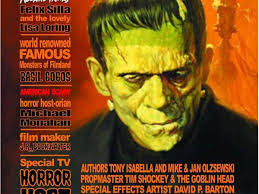 Meet longtime Summit County horror filmmaker J.R. Bookwalter, legendary graphic artist (specializing in horror-mag and book covers) Basil Gogos, Marvel/DC comics writer Tony Isabella, plus more Elvira/Vampira type scream queens than you can shake a skimpy outfit at. Expect also a plethora of macabre merch vendors, panel discussions, cool costumes and creepy flick screenings. It all happens at the Quaker Square residence complex by the University of Akron Campus, at 135 S. Broadway St. Admission is $10 Friday from 5 p.m. to 10 p.m., $15 Saturday from 10 a.m. to 6 p.m., or a $20 pass for both days. Children 13 and under admitted free with a paid adult admission. There is also ample free parking. For more information go to http://www.monsterfestmania.com.